On June 26, 2013 the JPO announced a revision of the examination standard regarding “unity of the invention” and “amendments that shift of special technical features of the invention”. The revision will be applied to all applications examined from July 01 of the same year. As this revision relaxed the examination standard filing in Japan has become more convenient for applicants. In this one point lesson we would like to provide a deeper understanding of the requirements for unity by explaining examples taken from JPO reference material. As explained in last month’s news there are 4 important points regarding the requirements for unity. Before the revision (A) inventions including all matters specifying the invention where STF were found first would be subject of examination. 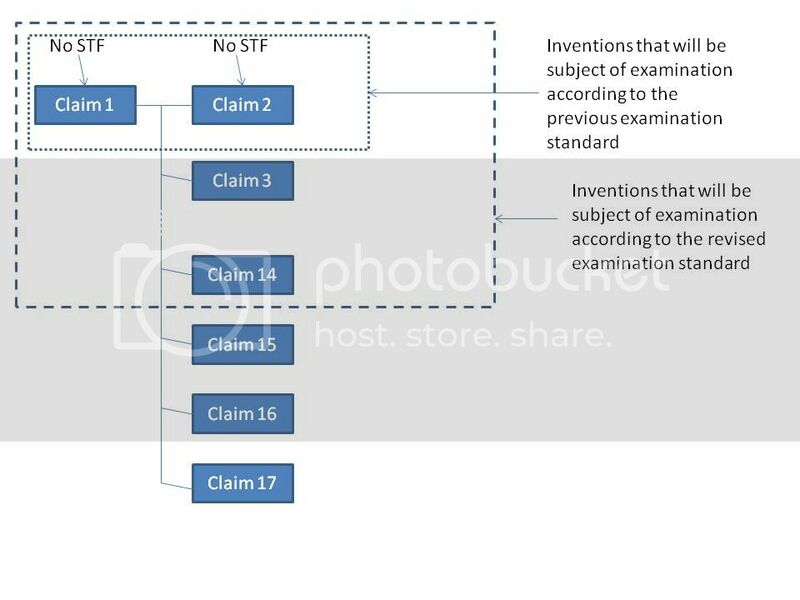 In addition to that now (B) inventions that have the same or corresponding STF to the invention where STF were found first will be subject of examination as well. Also now (C) inventions including all matters specifying the invention in claim 1 (inventions depending on claim 1) will be examined. However inventions with only little relevance will be excluded. Finally as before (D) inventions that have been examined until STF were found first and where the examination has been substantially finished fulfill the requirements for unity. We will now have a look at some examples and see if the above points apply. Claims 1 to 5 are subject of examination. Claims 1 to 3 apply to case D descrived above. Claims 4 and 5 apply to case B. No STF were found in the invention described in claims 1 and 2. Claims 1 – 14 will be suject of examination. Claims 1 and 2 apply to case D and 3 – 14 apply to case C. As for claims 15-17, they might apply to the exception of case C and might not be suject of examination. Even if they also try to reduce the weight of glasses, the have been judged as having little relevance to claim 1 and the additional STF. * “Special Technical Features (STF)” refers to the demonstration of a technological contribution to the prior art of the invention in question.